In a highly technocratic world, problems and solutions tend to be identified with mechanized events. Cars cause pollution, so electric cars will minimize it. Bad logging practices exacerbate hillside erosion, so a new landscaping practice will fix the problem. Soil quality is depleting, so a new synthetic fertilizer and gene-spliced plant will provide the harvest we need. When used for the proper purpose, there is nothing wrong with technology. Indeed, there is much we should be thankful from technology. But the potentials of technological solution and the excitement of innovation has eroded the sense of character that would cause people to ask why we need those things in the first place. In his latest book, Virtues of Renewal, Jeffrey Bilbro picks up on this theme by considering how Wendell Berry’s writing can shape the moral imaginations of readers to inculcate virtue that leads to environmental, social, and spiritual renewal. Bilbro, an associate professor of English at Spring Arbor University, sifts through Wendell Berry’s work in its several genres to see how the Kentucky farmer’s writing can help contemporary readers become better attuned to the patterns and forms of creation. In seven chapters, the book covers a series of virtues: attention, gratitude, humility, hope, memory, fidelity, and convocation. These are not the virtues one typically finds in a list, but they do accurately reflect the categories in which Berry writes, so they are useful for this volume. This is a helpful book, since it moves the reader to consider our modern lifestyle from a different angle. Berry is an odd thinker. He defies most common labels. He is too progressive to be a conservative, but too conservative to be progressive. He sometimes sounds like an evangelical, but then in another essay it is clear that he doesn’t fall into that camp. In the best sense, Berry is someone who has thought through things, and generally done so carefully, so that even when readers disagree with him, they can learn something. Virtues of Renewal works at several levels. It is a well-written and well-researched book on a contemporary author. Bilbro does his literary criticism well. The book is also a call to rethink ecological stewardship and whole-life stewardship through the literature being analyzed, so it has a heavy dose of practical ethics. Most significantly, the book is a delight to read because the prose is carefully crafted and it points to something beyond its own pages. One of the most compelling aspects of this book is that it channels Berry’s ethic of simply doing the right thing. Instead of focusing on trying to solve the world’s problems in one fell swoop, Berry argues that we should just do the good things that are close at hand. So often attempts to fix big things quickly lead to hypocrisy, abuse of power, and a loss of purpose. The localism that is romantically represented by Berry’s writing is helpful because it calls us back to the hard, messy, inconvenient fixes that are close by instead of the clear, but impossible solutions needed for the world’s big problems. My quibble with this volume is Bilbro’s use of the phrase, “practicing resurrection,” to refer to redemptive activities in the world. He borrows it, I believe, from Berry. In principal, what he means is “doing restorative actions” or “working toward reconciliation.” Resurrection is a work that only God can do, so I prefer other ways of describing an impetus toward setting things right and living in balance with the world. It’s a small criticism, but worth noting. 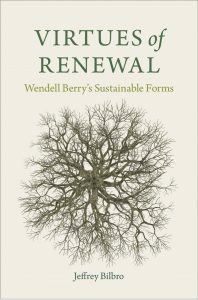 Virtues of Renewal is a volume that environmentalists, those concerned with the erosion of social structures, and fans of Wendell Berry (often overlapping categories) will enjoy. Bilbro is a fine writer and this latest volume is no exception.